My Betty Shopper is finished! See Rachel’s floral knitting bag? She found it at a flea market. 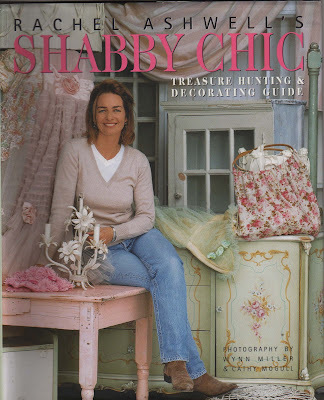 It inspired her first ‘Shabby Chic’ fabric line. I’m so thrilled to have finally finished my Betty Shopper bag. It’s an Amy Butler design and I think it turned out great. This is one of those sewing projects that would have turned out like crap 10 years ago or more because I used to rush through sewing projects and ignore mistakes. With my middle age has come patience and a desire to do things slower and take my time to achieve more perfection. The inside is lined with a vintage forest green with tiny pink rose buds on it. I even made a cell phone pocket inside. I used a Shabby Chic curtain panel purchased from Target. I washed the curtain first, then ironed it and used it to make the purse. 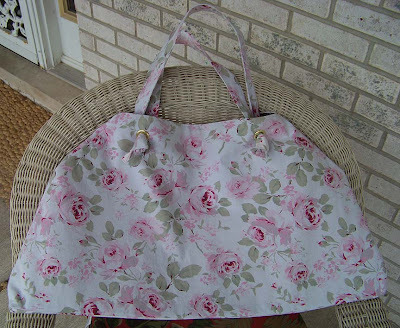 I was very inspired by the pink and white floral print knitting bag Rachel Ashwell found at a flea market years ago. It looks like the handle was made from a wooden embroidery hoop. You can see it on the cover of her first book. This knitting bag, by the way was her inspiration for the Shabby Chic fabric line (or at least, so she says!). She says it looks great over her shoulder when she wears jeans and a white teeshirt. I’m in the mood to create more Amy Butler purses. I am going to start on a Madison bag using some black Eiffel tower cotton. The inside lining is going to be made from a Frenchy novelty print. Will post photos when finished. It’s back to the sewing machine…see you in a few days! It's beautiful, Em! You did a great job on it and it looks so fun & trendy! LOVE IT! i love the bag!! you did an awesome job! !